Zornberg, Avivah Gottlieb. 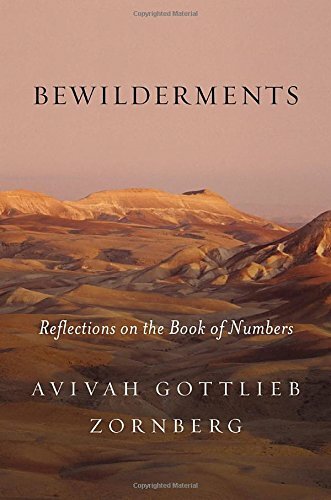 “Bewilderments: Reflections on the Book of Numbers”, Schocken, 2015. I am a huge fan of Avivah Gottlieb Zornberg and I most definitely do not always agree with her but I do value what she has to say. When I began seriously studying the Five Books of Moses (Torah) some ten years ago I bought Zornberg’s “Beginning of Desire” and used it almost all the time while studying the book of Genesis. I continue to use it today and I rarely make an assumption on text without seeing what she has to say. The Book of Numbers is the continuing story of the Israelites as they journey for forty years from slavery to freedom. It is also the sad stories of their desire to return to Egypt ands their dissatisfaction with no clear direction. This was even before Caleb, Joshua and the other spies were sent out to look at the land and then brought back disappointing results. The people complain and lament their fate and we see their skepticism over where they are where they are going. They seem to have forgotten the miracles they experienced and that allowed them to leave the Egyptian yoke. Many see the Book of Numbers as a distraction because we spend so much time reading of the unhappiness and complaints of the people who, at times, seem to disregard all that God has done for them while others see it as human nature. There is yet another interpretation and this is what Zornberg shows us here. If we read the book as the mystics and the Hasidim do, we see another aspect of those on the journey. They are seen as people who have lived through a spiritual experience like none other—they are those to whom God gave the Torah, they experienced God’s miracles and how he worked to set them free; they were given nurture directly from the Divine and they were God’s partners in conversation. We do not have to see them as a whining group of complainers but as a people who had indeed transcended all they knew in order to obey God and his demands. It was only natural that they did not always agree— after all, there had been no precedent to consider; they were blindly following orders. We sense their desire for spiritual guidance and we can cheer them on while knowing that what they are experiencing will change to course of history for everyone. Here is the full and total expression in the belief in an unseen one God. It is human nature to complain when things do not go well just as it is natural to fear and condemn that which we do not know or do not see. The Israelites complain at the same time that they celebrate who they are and where they are going. Their words are not unlike the words we speak today when we are not happy with a situation. Yet the Israelites seemed to know that they are on a special mission and being guided there by a Supreme force that is yet unknown to them. We cannot forget that we really do not know much about—all we know is what we have been told. They have been through the horrors of slavery, they have experienced and continue to experience great miracles sent to them by this unknown deity (who is yet not formalized); they are the recipients of the Torah. Would we, in this modern age, not react in much the same way that they did? Zornberg shows how their discomfort and their distrust can be integrated into the more positive narrative by looking at the exodus from literary, psychoanalytic and scholarly perspectives as she analyzes the text. Suddenly we, or at least, I see the children of Israel not as distrustful complainers but rather as spiritual possessors of God’s dream to make them free and in their own land. Zornberg does not retell the Book of Numbers, she comments on it and she does so with grace and beauty while she brings together psychology, philosophy and the very best of biblical literature to describe those forty years. Indeed, the children of Israel were bewildered as the title of the book suggests but we do not see bewilderment as negative; instead we see how it plays into the Bible and the belief in the Divine. Zornberg writes not only with great biblical literacy but with beautiful English expression and, in my opinion, this is the easiest of her books to read and to comprehend. Reading the Book of Numbers can be a chore that is not always well accepted but I maintain that with this new commentary, people will be eager to have another look. Avivah Gottlieb Zornberg is the author of The “Beginning of Desire: Reflections on Genesis” (a National Jewish Book Award winner), “The Particulars of Rapture: Reflections on Exodus”, and “The Murmuring Deep: Reflections on the Biblical Unconscious” (a National Jewish Book Award finalist). She was born in London and received a PhD in English literature from Cambridge University. She lectures widely in Israel, the United States, Canada, and the United Kingdom. This entry was posted in Judaica on March 21, 2015 by Amos.